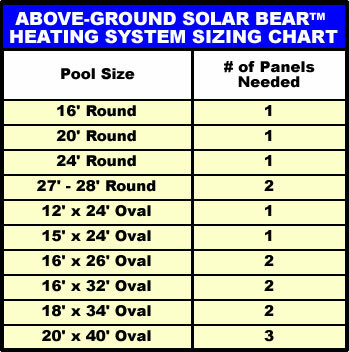 Solar Bear Above Ground Pool Solar Heaters (includes 1 - 4'x20' panel & system kit). Manufactured by the premier company in the solar pool heating business (they have installed over 150,000 solar pool heating systems), these solar pool heaters have been efficiently heating above ground swimming pools since 1972. FREE SHIPPING! 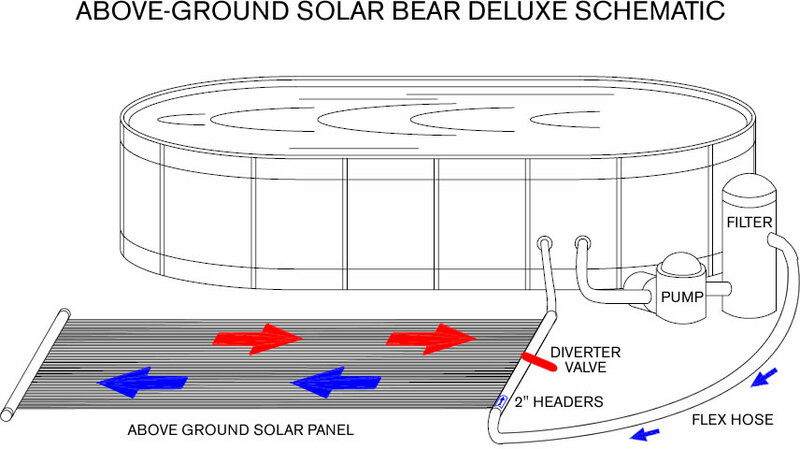 The Solar Bear Solar Heat Exchanger system comes with a 4' x 20' pre-plumbed panel, hoses, clamps, installation tool and hardware as well as System includes a Roof Mounting Kit and Panel Repair Kit. Designed to heat up to a 24' round or 15' x 24' oval above ground pool. Manufactured by the premier company in the solar pool heating business (they have installed over 125,000 solar pool heating systems), these solar pool heaters have been efficiently heating above ground swimming pools since 1972. The Solar Bear’s surface is fully whetted by pool water insuring the most efficient solar panel available. Extra large 2" headers do not slow down your pool’s circulation and insure excellent solar heat transfer to your pool’s water. Smaller 1-1/2" headers can reduce your above ground pool’s circulation and cause solar pool heating to be compromised. 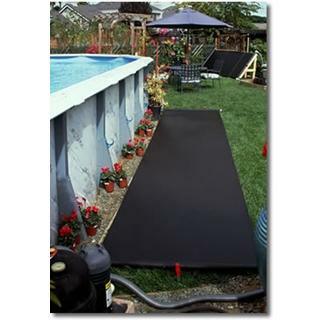 Solar Bear pool heater systems are comprised of a single extra-large 4’ x 20’ collector panel--providing 79.2 sq. ft. of parallel, circular heating channels--so you don't have to worry about couplings or connectors. The solar panel is made of U.V. 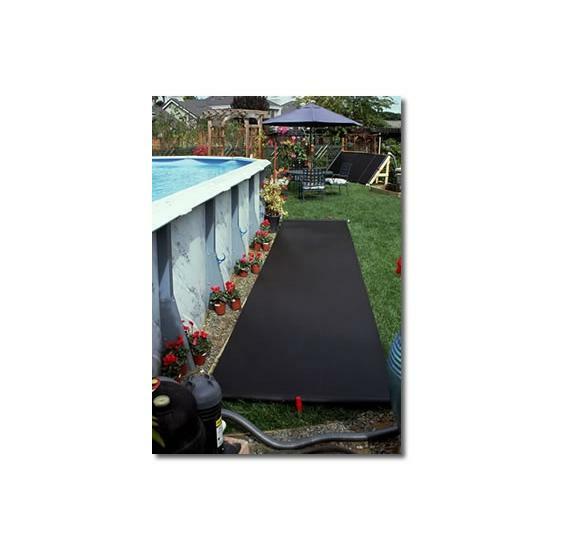 stabilized polyethylene that is very tough and will last many pool seasons under direct sunlight. The heating system comes complete with an integral bypass valve, so you can turn the solar heated water on or off as needed. Also included are two 6 foot hoses, four clamps to hook the system up to your pool's filtration system, a roof/rack mounting kit (solar Bear solar panels can be mounted on the ground, on a rack, or a nearby roof), and a panel repair kit. Complete installation and user’s manuals are included. 10 year manufacturer's warranty. An optional Bypass Valve Kit is available seperately but ideal and recommended for roof mounted applications where ground level access to a bypass valve is desired. Note: For solar panels to heat your above ground pool optimally, they must receive unobstructed sunlight between 10 a.m. and 4 p.m. This solar pool heater works like a charm! It certainly reduces our pool heating costs. Definintly go with the solar pool cover as well.